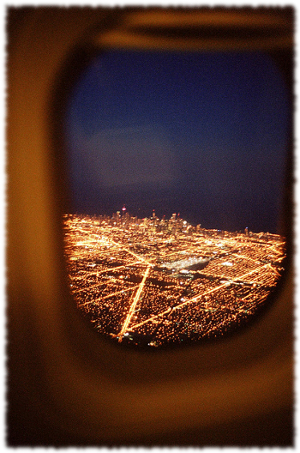 Randomly saw this picture on Tumblr the other day and immediately a rush of memories washed over me from all the times I sat on a plane and looked out on a view much like this one. The plane is nudging this way and that, trying to orient itself to the airport’s runway. Rows of amber city lights bob in the little windows, there’s people down there but you can see them. Instead it all seems like one giant living thing with sparkling streetlights for veins. The passengers in the plane stir in their seats and sleepily start into their own bit of orienting. Buttoning back tray tables, smoothing out their wrinkled clothes, checking phones for who knows what. Basically it’s all rituals to busy themselves while mentally preparing to enter into this other place, whatever it means to them. After all, once the threshold of the plane is crossed a whole mass of new sounds, sights, smells, experience will wash over you all at once… you’ve got to get your game face on.